This can be a challenging question for many in the stock trading and investing fields. There are hundreds of computers on the market from local re-sellers to big retail stores. But, as trading software and technology advances, trading computers have become a necessity for individual investors needing to keep up with the mounds of data required to trade successfully. Our team at EZ Trading Computers has spent years researching and designing custom trading computers to build the ultimate machine that embodies both speed and affordability. Our advice certainly isn’t the only path you could take to buying a trading computer. However, it’s informed by years of research, design, and testing computers for the specific use of electronic online trading. Born out of all of this hard work is a machine that works hard to help you make you money as a trader. After all, if you had a blank check, you could buy a computer that would far surpass all other trading computers. However, that’s not what traders need. Your capital needs to be in your trading account, not in an overpriced computer. You don’t need an unlimited budget to buy a super fast trading computer. You could buy a low-end computer. However, there is a problem with going too cheap on a trading computer. These simple machines are not built for traders and just won’t cut it. Too inexpensive often means outdated or underpowered. When it comes to computer hardware, you are often trading dollars for power and speed. Super low cost means super low ability. It’s the difference between a Yugo and BMW. You get what you pay for. The processor can make or break your experience. Trading data is massive. In order to make chart data nice and organized for you to review and make profits, your computer has to do a ton of work. A computer with a processor that can’t handle this task is going to cause you a ton of issues. A low-end processor simply wasn’t built to take on this task. It’s like trying to tow a car with a bicycle. As a trader, you need a computer with a super fast processor. Data lag and sluggish performance are unacceptable for trading. With the right processor, it’s completely avoidable. What qualifies as the fastest trading computer? If 80% of all users are average computer users, as a trader, you are in the other 20%. Your daily tasks on your computer demand a higher amount of power causing you to be classified as a power user. Workstations for power users contain internal hardware specifically designed to function at a high-level. This formula shows you that a fast trading computer for power users is the sum of all of its parts. The brand and quality of those internal components is paramount to the power and ability of the computer. The best computer for active and professional traders is a computer designed to accommodate power users. This type of workstation will have substantially more ability than can be found in low-end, inexpensive machines. For active traders, screen real estate is like productivity gold. Multiple monitors won’t make you work harder or trade better. However, they will allow you to have all of the information you need at a glance to allow you to accelerate your success. You don’t need multiple CPU towers to have a nice amount of monitors at your workstation. The best stock trading computers will allow you to run multiple monitors from one PC. You should choose a trading computer that has quality graphics cards installed. You don’t need super high-end cards. You will want reliable graphics cards with on board ram to support your multi monitor setup. New traders and advanced traders have turned to custom built systems over the last several years to purchase a higher quality trading system than one can find in retail stores. Custom trading computers allow investors to trade on a machine that was specifically designed for the task. This allows day traders peace of mind that their trading system is super reliable and will continuously perform at peak levels during its useful lifespan. As consumers, we hate over paying. Retailers know this – that’s why there are 14-day money back guarantees, price match policies, and low price guarantees. When it comes to buying a trading computer, how can you be sure you are getting the best deal possible? Take advantage of promotions and sales. Often, custom builders run sales when they are able to get deals themselves on the components installed in the computer. This means that there is an additional savings that can be passed along to you. Usually, these types of promotions will have a limited number of computers able to be sold at that price. Now, you know an insider trick on how to get a super fast trading computer at the lowest price possible. The biggest compliment a business can get is return customers. This is true in restaurants, small businesses, and large retailers. While this type of information might not always be available to you, there are a couple places that you could check out to get a trading computer review from a trader who has bought multiple computers from the same company. Often, you can find helpful advice and reviews in forums and on social media. Online retailers can also include this type of information in a feedback or reviews section of their website. A quick Google search might lead you to recent comments that you might find helpful in choosing where to buy your trading computer. If you know you should upgrade your trading computer, don’t put it off. It’s a risky risk. If you’re like me, you fight every day to keep risk as far away from your trading as possible. Trading on a machine that’s not meant for the task is like putting out a welcome mat for risk. You’re just asking for problems. As traders, there are often lots of money on the line. Why risk this type of capital to save a small amount of money on a computer. A good custom trading computer will include a great warranty. At EZ Trading Computers, we stand behind the quality of our computers by supplying our clients with a 5-year warranty and lifetime tech support. I consider this to be the required amount of time that traders should have a warranty on their computer. Although, not surprisingly, other trading computer builders supply their clients with shorter warranties and require additional payment for a longer-term warranty. I am not telling you this to persuade you to become an EZ Trading Computer owner. You need to know what should be the minimum requirements. This way you know when something is sub-par and not in your best interest. I hope this article has been super helpful. 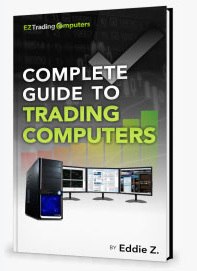 I am confident that these simple tips will help you invest in a computer that is going to allow you to make your trading more successful this year. Expert Advice – Take the shortcut. Leave all the research and testing to the Gurus. Don’t Be Too Cheap – Saving a few hundred bucks now might seem like a good idea. But, in hindsight it’s a mistake. Trust me. I’ve done it with other products. The Processor Is The Foundation – I can’t stress this enough. Build the right foundation for your computer. It’s crucial. Why Power User Workstations Are Necessary – You’re a power user. The sooner you know this, the sooner you will start using the appropriate tools. Run Multiple Monitors From 1 PC – You don’t need more than one computer to have a multi-monitor setup. You just need the right pc. The Benefits Of Going Custom – Customization gives you the power to buy a computer that suits you. You shouldn’t have to reform your technology needs to fit a mass manufactured machine. Getting A Great Deal – This is best way to trim a couple bucks off your purchase. Catch a promo or sale and get the same high quality machine for a bit less. Return Custom Feedback – The highest form of compliment is a customer who comes back again. Feedback from these types of clients are reviews you want to read. When To Upgrade – Don’t wait if you already know you need to upgrade. Inevitably, something will go wrong if your machine is past is usable life. Get A Good Warranty – Traders should have a warranty that spans the four to five year expected lifespan. Anything less is really just sub-par.